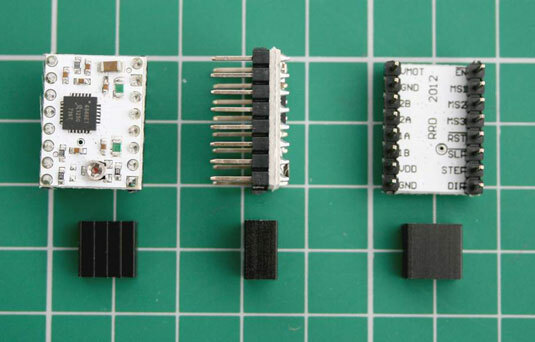 Which Position Sensing Module Should You Use for Your RepRap 3D Printer? With almost every RepRap 3D printer, the electronics need to know where the “home” position is. This is achieved by slowly driving each axis in a known direction until a limit switch or sensor is triggered. This tells the electronics you are at “0” for each axis. When the extruder carriage is at the “home” position, you can start a print job because the printer knows where to begin the many different 3D moves that start and complete the print. 3D printers use the initial home position as a universal reference point. From the moment the home position is defined, every move is calculated as a number of steps on each axis, each of which helps position the print head in 3D space. If an axis, carriage, or print head is knocked askew or is out of alignment compared to where the electronics think it is, the 3D printer continues to print but the model will be misaligned and usually ruined as the melted plastic is deposited in the wrong places. Just as the 2D dot-matrix printers of the past kept cluelessly printing, even if the sheet of paper was out of alignment while they were printing, so with 3D printers. Even many professional units are not yet intelligent enough to know when they’re going wrong or are out of alignment. An optical sensor breaks a beam of infrared light as the trigger tells the electronics that the carriage is at the “home” position. Because this is a non-contact switch, it’s considered more reliable than a mechanical microswitch. The most sophisticated form of positional sensing is a hall-effect sensor that detects a magnetic field. Its functioning is very accurate and highly repeatable and it’s non-contact. All you need to do is fit a tiny magnet onto the carriage or moving axis and place the sensor at the “home” position. When the magnet comes within a specified distance, it triggers the “home” signal to the electronics. Hall-effect sensors feature a small rotary knob you can turn to adjust the exact trigger distance of the magnet from the sensor. This type of sensor is most often used on the vertical Z carriage to set the position of the nozzle a precise distance away from the print bed, usually with a gap no thicker than a single sheet of paper. 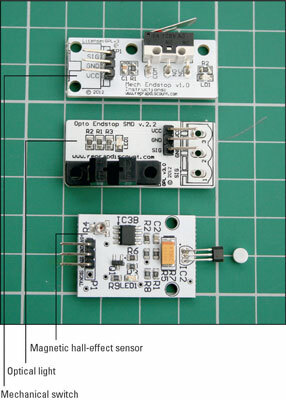 You can use any type of position sensor, or a combination of them. It’s highly recommended to use a tunable magnetic type for Z-carriage alignment.